After Water Damage. What to keep and what to discard? Outdoors. home / education center / water damage / recovering from water damage / what to keep and what to discard? outdoors. One of the toughest decisions you will have to make after water-related damage is what to keep and what to discard. As a general rule, anything you can not wash and disinfect should be thrown away. The following guide will help you determine if an item can be restored or must be discarded. The following guidelines are applicable only if the damage is caused by clean water. If you know or suspect that the water source is contaminated with sewage, chemical or biological pollutants, consult a restoration professional immediately. Do not use fans for dry-out before determining that the water is clean and sanitary. If a particular item has a high monetary or sentimental value, you may wish to consult a restoration water damage specialist. Ceiling tiles must be discarded and replaced within 24-48 hours. The only exception would be if a ceiling tile has become wet due to a minor leak or a steam leak and the shape of the tile has not been altered. In this case the ceiling tile can be air-dried and reused. 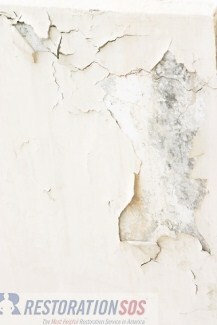 Concrete or cinder block surfaces can be kept and cleaned to remove stains and mold growth. Cellulose or fiberglass insulation holds water and wicks water up inside a wall. It must be removed if wet to prevent mold and decay. Wallboard (drywall and gypsum board) may be dried in place if there is no obvious swelling and the seams are intact. Wallboards must be removed and replaced if you detect the presence of mold or if there is a visual swelling and shape alteration. Wet paneling should be removed from the wall for inspection and drying. Carpet and backing can usually be cleaned and restored if treated in less than 24-48 hours and was dried completely. Make sure to that the sub-floor under the carpet is inspected and dried as well. If sewage-contaminated water covered the carpet, discard it for health safety reasons. Also discard if the carpet was under water for 48 hours or more. Flooring such as linoleum, ceramic tile, and vinyl can be salvaged if dried quickly. These floorings must be removed if you have wood sub-flooring to allow the wood to dry thoroughly (this may take several weeks). Discard this type of flooring if you detect signs of mold. Hardwood floor boards must be removed to prevent buckling. As wood gains moisture, swelling occurs. By removing a board every few feet you will be able to reduce buckling caused by swelling. Non-porous, hard surfaces such as plastic or metal surfaces can be kept but must be cleaned properly. Solid wood surfaces can be kept if dried within 24-48 hours and there is no sign of mold. Do not try to force open swollen drawers or doors. Discard wood pieces if severely damaged or if you detect signs of mold. HVAC ducts that have been soaked in water will probably need to be replaced if they are flexible ducts and made from duct board. Internally insulated ducts will also require replacement. If the ducts are made from sheet metal and have external insulation, they can be cleaned and retained. What to Keep and What to Discard? Indoors. After learning what can be saved and salvaged outdoors, you also want to salvage as many of your personal belongings as possible. However, keeping items that have been soaked for a long time may be dangerous. Learn how to determine what to keep and what to discard.